Paul DePodesta could have been like Billy Beane. He could have had his name, his image and his story immortalized on the big screen in “Moneyball,” the film about the 2002 Oakland Athletics set to premiere next weekend. 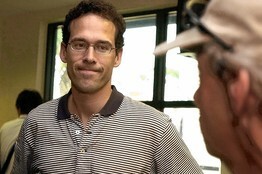 Paul DePodesta, who now works for the Mets, was the inspiration for Jonah Hill’s character in ‘Moneyball. But to DePodesta, the former Athletics executive who now works in the Mets’ front office, it was never his story. And the character that was supposed to be him always seemed like someone else. Which is why, for as much as the movie is based on a chapter of DePodesta’s career, it’s not about him at all. Unlike Beane, the longtime Oakland general manager who is played by Brad Pitt, DePodesta isn’t named in the movie. His character, played by Jonah Hill, was given the fictional name of Peter Brand—at DePodesta’s request. DePodesta’s unease with the movie isn’t a matter of shyness, though. And has nothing to do with Hill. Though the dough-faced actor looks nothing like him, DePodesta said Hill is “terrific” at his craft. What makes DePodesta uncomfortable is the idea of being typecast as a laptop-toting, Ivy League nerd who eschews traditional scouting and relies only on statistics in making decisions.